This sparkling wine is made in the traditional Methode Champenoise, with the base made from the Cuvee press portion only. After fermentation, some of the barrel aged sparkling base was added from the previous vintage for complexity; and then the wine was filtered in preparation for bottling. Yeast and 24 grams/ liter sugar was added at the time of bottling to create another percent of alcohol and 5 atmosphere of pressure in the bottle from the second fermentation. The bottled wine was then laid down for over two years before Riddling and Disgorging. A final dosage of 0.85% sugar was added to balance the natural acidity of the wine. 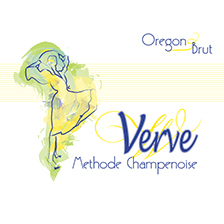 This Oregon Methode Champenoise sparkling wine is a fresh and elegant blend of Pinot Noir (72%) and Chardonnay (28%) grapes. Extended en tirage time adds layers of complexity which makes this wine a versatile pairing with many foods and all good company. The tightness of the extra-fine bubbles & the soft straw color of this wine is beauty in itself. Aromatics of the white pear combined with yeasty bread notes perfume the glass. The effervescence of the bubbles along with the pleasant flavors of apples, pears and soft huckleberry fill the mouth, while the brightness of the palate lingers long into the finish.